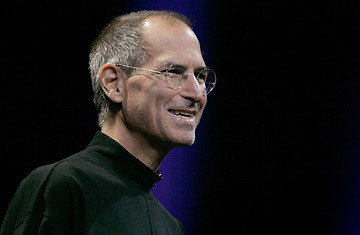 Apple CEO Steve Jobs gives the keynote speech at the Apple Worldwide Developers Conference in San Francisco. Most CEOs don't think of business as art. But Steve Jobs always has. That's partly why whenever he unveils a new product, the event feels like a rock concert. But I think the "art" of Jobs goes so much deeper. Years ago, Charles Bukowski, my favorite drunken, dead poet, wrote: "To do a dangerous thing with style, is what I call art." Buk was talking about bullfighting, boxing, making love and, er, eating sardines. Had he been around long enough to see the iPhone 3G, he'd probably concede that what Jobs did yesterday is high art too. We'll take the fact that the iPhone 3G is stylish as a given. Most people probably don't appreciate that what Jobs did was also extremely dangerous. Basically, he's betting that, at $199 a pop, he'll sell so many iPhones that Apple will dominate the rapidly developing mobile Internet platform. Indeed, he believes that this new phone is so compelling  and so within the reach of the masses  that it's worth revisiting the deal he struck with AT&T for the 1.0 version, which reportedly gave Apple up to $12 to $18 per month on every iPhone that AT&T serviced. Instead, AT&T and other international carriers will now be providing a subsidysupposedly about $200 a phone  to make the device affordable enough for the masses. The math works pretty well for AT&T, which would lock in new subscribers to two-year contracts; the cheapest service plan, with data, is $69.99, $10 a month more than the old one. But for Apple? Over the course of a two-year contract, the company could lose as much as $160 per user versus the old deal. That explains why Apple's stock dropped more than 2% on Monday. Making Jobs' bet even more dangerous is the fact that we're about to see a whole raft of devices coming out that could give the iPhone 3G real competition. Google's open-source operating system for mobile phones, Android, is just about ready to be shown off in many handsets, from makers such as HTC, Motorola, Samsung and LG Electronics. You can bet that many of those phones will be way cheaper than $199. Of course, that's where the rest of the Maestro's art comes in. The Apple brand is synonymous with style  that's why so many people were willing to pay $599 for the iPhone a year ago, knowing full well that they were little more than beta-testing a pokey 2G device that, in many ways, was obsolete the moment it went on sale. It was easier to rationalize if you told yourself you weren't buying a gadget  you were buying art! That's not a local phenomenon, by the way. By broadening Apple's reach to 70 countries, people all over the world will now be able to buy a new iPhone. While the iPhone now accounts for 19% of the U.S. market, its global market share is less than 5%. Jobs said that the cost would not exceed $199 anywhere on the planeta great deal for people who make euros rather than dollars. Aside from making money on each phone sold, Apple will also make money in other ways. While many applications, "if not most," as Apple's marketing boss Phil Schiller told me, will be free to consumers, others won't. Apple will take 30 cents out of every dollar developers make selling their wares at Apple's App Store. Likewise, the more people who buy iPhones, the more folks who will pay to download music and videodespite its power-hungry, high-speed performance, the 3G phone will allegedly give seven hours of video playback and 24 hours of good old-fashioned audio. But you get the point. This is just the start, and it's easy to see how the iPhone could take off. Once you control the platform, you call the tune. And if that happens, it will be Steve Jobs' magnum opus.